Korean pop superstars and world-renowned boy group, BTS, kicked off their second world tour in the United States. The Staples Center hosted the group for a total of four concerts on Sept. 5, 6, 8, and 9. Initially, the group was scheduled to perform in the Staples Center for three days. Due to the intensive demand for tickets, BTS’ entertainment company Big Hit Entertainment and event organizer Powerhouse Live were required to add another date to satisfy demands. According to Forbes, tickets to the fourteen concerts of BTS’ Love Yourself Tour in North America are the most expensive tickets in the secondary market of summer 2018. Statistics from ticket seller TickPick show the average resale price of tickets for BTS in comparison to those of Bruno Mars, Cardi B, U2, Elton John, Britney Spears, and many more touring artists of 2018. With this demand, the group was able to sell out over 60,000 seats in the Staples Center this past weekend for the first dates of their world tour. Though the frenzy for the first tour dates at the Staples Center was thought to have begun when tickets went on sale for the first three dates back in May, it was far more hectic the week of the tour. For the concert on Sept. 5, fans began to camp out for general admission spots starting as early as the Sunday before Labor Day, despite Staples Center’s rules that no camping allowed. However, both Big Hit Entertainment and Powerhouse Live came to a conclusion that they would be honoring this line due to safety reasons. As for the merchandise line, lines began as early as sixteen hours or more prior to the concert. Additionally, the merchandise line and the BTS Fan Experience began as early as sixteen hours or more prior to the concert. Lines such as these ones lasted the entire week and throughout the weekend for the advancing concert dates. In the midst of tens of thousands of BTS fans, some Corona del Mar High School students were lucky enough to purchase tickets back in May for one of the shows. Passionate fans of BTS camped out days in advance for the first day of the tour, whether it was for the general admission pit or merchandise. “Our friend started camping out on Monday afternoon for us. Though the concert started on Wednesday night, we wanted to make sure that we were in the front row. Though sleeping on the streets of LA can be tiresome, it ended up being worth it in the end. We wouldn’t have done it any other way,” said Corona del Mar High School senior Taylor Tasu. The line that stretched to over four hundred people by Wednesday morning ultimately attracted many American media platforms. Major news outlets such as ABC News, NBC News, Billboard News, and many more were all sure to come out in the morning to report on the status and length of the line, all in addition to interviewing many of the fans. 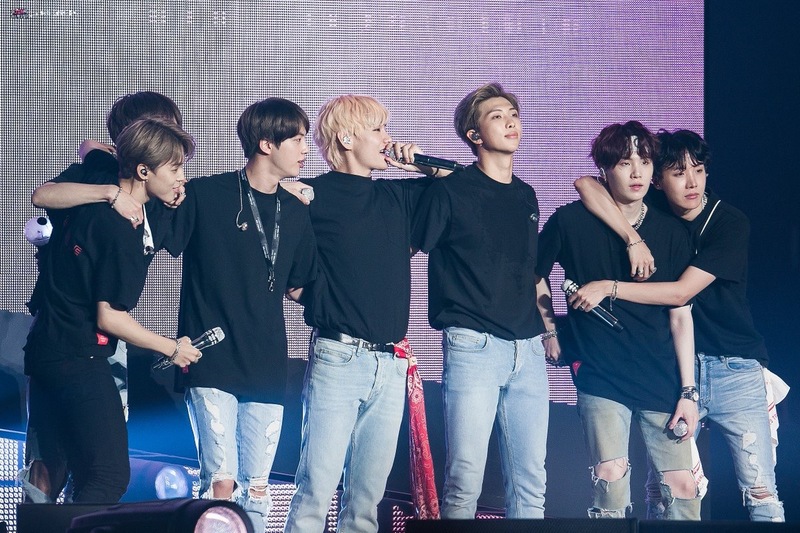 With this overwhelming amount of anticipation and excitement, BTS was able to kick off their second world tour in the United States successfully at eight o’clock on Sept. 5. The concert lasted for approximately two and a half hours, filling the Staples Center with screaming BTS fans and the booming bass of BTS’ hit tracks. The group performed a total of over 20 of their songs. They opened the show with the hit song ‘IDOL’ from their newest album “Love Yourself: Answer,” the final and closing album of the Love Yourself series. Other songs that were performed on the opening day that one may have heard of included Save Me, I’m Fine, I Need U, DNA, Go Go, Blood, Sweat and Tears, Boy in Luv, Danger, Fake Love, and Mic Drop- to name a few. The transitions from their most hype songs to those that tugged on one’s heartstrings made for overall a perfect and fun atmosphere. “One of the best parts of the concert was the A.R.M.Y Bomb Ocean. It was so cool to see thousands of little lights lighting up while changing color from inside the Staples Center to the beat of each song. I think it’s very cool how they were able to sync the lightsticks through Bluetooth this year,” said Corona del Mar High School senior Kristina Narinyan. BTS’ fans, notably referred to as the A.R.M.Y, lit up the Staples Center with lightsticks called A.R.M.Y bombs, which were available for purchase both online and at the venue. It was the ultimate addition to the show that made the concert that much more enjoyable. Finally, on Sunday night, BTS wrapped up their final show of the Love Yourself Tour in Los Angeles. Leader RM’s speech at the end made fans especially emotional, not only reminding A.R.M.Ys to remember to love themselves, but to remember that BTS would always be there for them. They also hinted at the fact that they would be coming back to Los Angeles for another world tour in the future, leaving fans excited for the next time they would return. “The answer to the question isn’t in our album [Answer]. But, I think now, I found 18 thousand answers right here [referring to the fans who attended the concert]. I hope that me, and our 7 members of BTS as a team, can be one of the many answers in your life,” said leader RM, making for a perfect ending for a perfect week of shows in Los Angeles.